With most of the Christmas cooking and feasting under my belt, I was amused to read an article on the BBC web-site by the author Will Self, with the intriguing title, ‘The British Vomitorium’, exploring the our national obsession with food. Half-way through, I was stopped in my tracks by the phrase ‘You are what you eat’ and whilst struggling to extricate my mind from images of Gillian McKeith dishing up quinoa and mung bean fricassee followed by the eager anticipation of examining the end product, ideas and questions began to bubble up and burst like grains of wild rice in my head. Firstly, where did this phrase originate from? A quick search via Google yielded some answers: The French gastronome Brillat-Savarin wrote in 1826 “Dis-moi ce que tu manges, je te dirai ce que tu es.” (Tell me what you eat and I will tell you what you are), and in 1863/4 Ludwig Andreas Feuerbach wrote “Der Mensch ist, was er ißt.” (Man is what he eats) Thank goodness for Google and Wikipedia. I couldn’t see that this observation had been replicated, but if true would imply a win-win scenario for both tick and Borrelia, providing the bacterial population growth remained within certain limits. 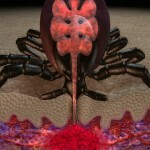 In a further act of reciprocity, infected ticks deposit a range of immunosuppressive salivary proteins into a bite site during feeding, facilitating bacterial survival in the early stages of infection. I suppose other organisms including humans live in harmony with ‘friendly bacteria’. Odd to think a tick blood meal could be their equivalent of Yakult! 1. Hermann C, Gern L, J Med Entomol. 2010 Nov; 47(6):1196-204.